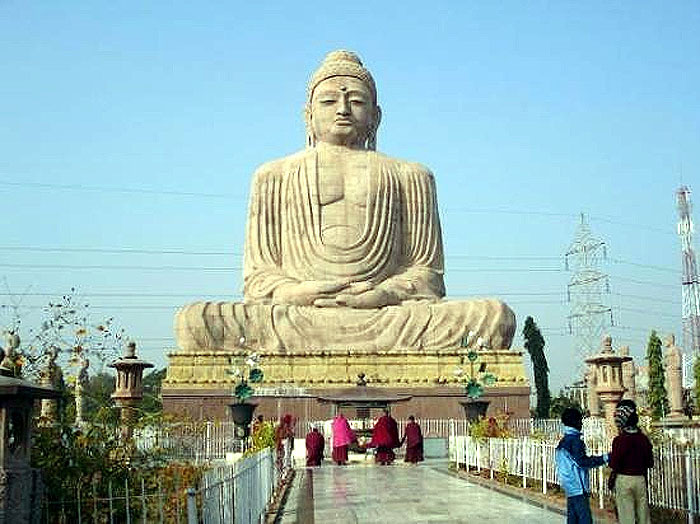 The city of Bodh Gaya is located in the district of Gaya which is one of the districts of Bihar. Each and every name has different connotation broadly associated with the life history of Lord Buddha. The name of Sambodhi refers to "complete enlightenment" whereas Bodhimanda refers to the spot under the Bodhi Tree where the Buddha attained Enlightenment. Vajrasana simply means the "Diamond Throne" where Lord Buddha sat to attain the Enlightenment and the name of Mahabodhi is most enduring name which stands for "great enlightenment". However, with the passage of time, the place came to be known as the Bodh Gaya and the tree where he attained Enlightenment as Bodhi Tree. Bodh Gaya is the most holy place on Earth for the fo llowers of the Buddhist faith all over the world. Situated by the bank of river Neranjana the place was then known as Uruwela. King Ashoka was the first to build a temple here. Buddha was born 563 BC in Nepal  on the following auspicious Baisakhi purnima. As Siddhartha, he renounced his family at the age of 29 his gaining enlightenment in 534 BC  and travelled and meditated in search of truth. After meditating for six years at Urubela (Buddhagaya) in Gaya, he attained Buddhatva or enlightenment. Enlightenment is a state of having infinite knowledge, and being able to accomplish the Noble and Universal truths. By gaining enlightenment, you enter Nibbana, in which the final stage is Parinibbana. At this place, the Buddha encountered the five men who had been his companions of earlier austerities. On meeting the enlightened Buddha, all they saw was an ordinary man; they mocked his well-nourished appearance. "Here comes the mendicant Gautama," they said, "who has turned away from asceticism. He is certainly not worth our respect." When they reminded him of his former vows, the Buddha replied, "Austerities only confuse the mind. In the exhaustion and mental stupor to which they lead, one can no longer understand the ordinary things of life, still less the truth that lies beyond the senses. I have given up extremes of either luxury or asceticism. I have discovered the Middle Way". This is the path which in neither easy (a rich prince) nor hard (living in austere conditions practicing self-denial). Hearing this, the five ascetics became the Buddha's first disciples. 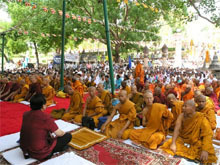 These disciples of Gautama Siddhartha began to visit the place during the full moon in the month of Vaisakh (April–May), as per the Hindu calendar. 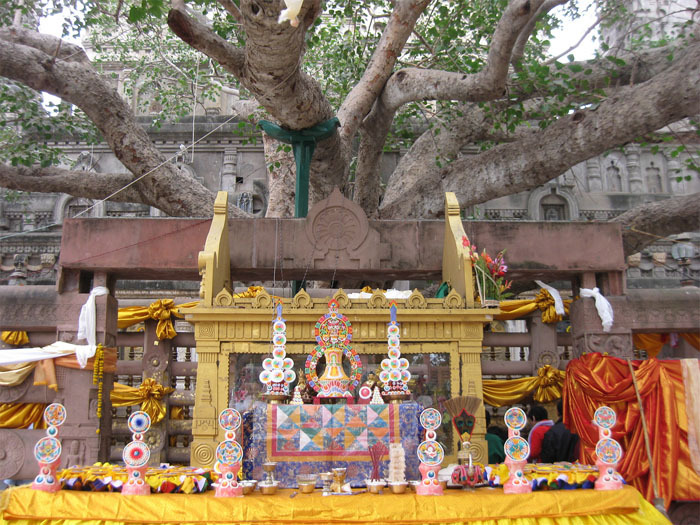 Over time, the place became known as Bodh Gaya, the day of enlightenment as Buddha Purnima, and the tree as the Bodhi Tree. 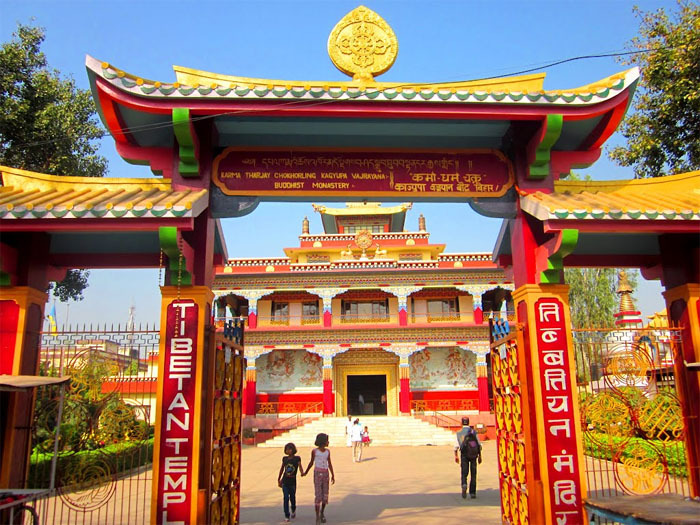 The history of Bodh Gaya is documented by many inscriptions a nd pilgrimage accounts. Foremost among these are the accounts of the Chinese pilgrims Faxian in the 5th century and Xuanzang in the 7th century. The area was at the heart of a Buddhist civilization for centuries, until it was conquered by Turkic armies in the 13th century. 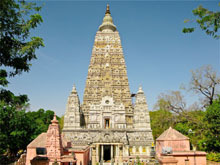 The place-name, Bodh Gaya, did not come into use until the 18th century CE. Historically, it was known as Uruvela, Sambodhi, Vajrasana or Mahabodhi. 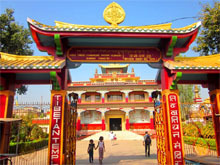 The main monastery of Bodh Gaya used to be called the Bodhimanda-vihāra (Pali). Now it is called the Mahabodhi Temple. Five bombs were detonated in Mahabodhi temple premises on July 7, 2013. 4 bombs were also detonated in town while three were defused. 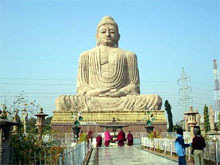 Bodh Gaya is located about 13 km from Gaya, 450 km west of Calcutta, and 90 km south of Patna. The Mahabodhi Temple is one of the four holy sites relat ed to the life of the Lord Buddha and the other three being Kushinagar, Lumbini and Sarnath. It is believed that Ashoka the Great visited to the site of Bodh Gaya after 250 years of Buddha's Enlightenment and he laid the foundation of Mahabodhi temple. But after the decline of Buddhism this temple was abandoned which was later restored by "Sir Alexander Cunningham along with J.D. Beglar and Dr Rajendralal Miitra" who worked for British Archaeological Society in 19th century. In 1949, the Government of Bihar passed an Act by which the Government makes itself responsible for its protection, management and monitoring. It was in 2002, the Mahabodhi Temple nominated for a UNESCO World Heritage Site with the following justification. It is one of the earliest existing temples of India; it provides exceptional records for the events associated with the life of Buddha; it is built entirely in brick. This is the f amous tree under with Lord Buddha meditated. At the back of the main temple this ancient pipal tree (Ficus religiosa or Bodhi tree) is located. Besides Mahabodhi Temple, Bodh Gaya offers many other pilgrimage sites to visit. The present initiative of the Bihar Government on the vision and operationalization of the Nalanda University is a milestone in the process of Bihar Renaissance – the revival of the past glory of Bihar. 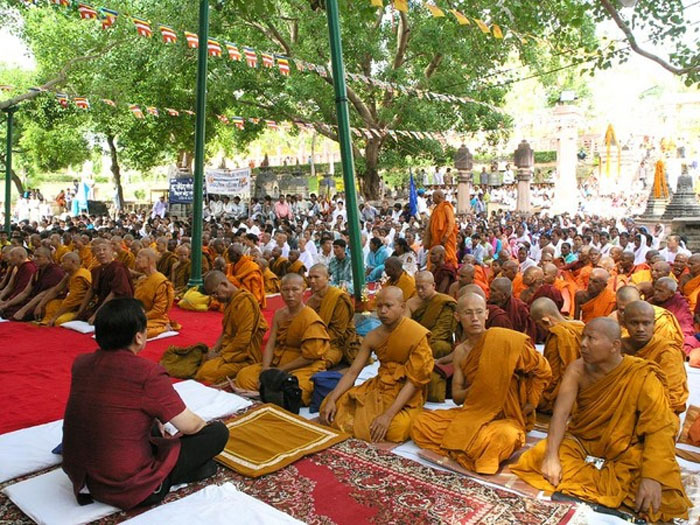 The devout Buddhists from all over the world visit here to study Buddhism. However, the tourist attractions of Bodh Gaya are Bodhi Tree under which Lord Buddha attained enlightenment; almost all the Buddhist countries have their architectural representative in the form of Temples at Bodh Gaya. Some of the temples or monasteries of other countries are Thai temple, Tibetan temple, the Burmese temple, Japanese temple Chinese temple, Bhutanese temple, Vietnamese temple, Korean temple, Taiwanese temple, Sri Lankan temple, and Nepalese temple etc. Some other attractions are Vajrasana, Chankaramana, Arimeshlochana, Ratnagar, Archaeological Museum, the Mohanta's Monastery, Tibetan Mahayana Monastery etc.